Have you ever met someone who just got you, even from your very first interaction? Well, that was my experience with Angie. She, like me, likes all things creative. And I think when 2 creatives connect, magic ensues. Such was the case with Angie and Evan's engagement session in Glen Helen. With the sun shining over the cliff, and just enough spring green sprouting, their engagement session in Glen Helen was pretty magical. 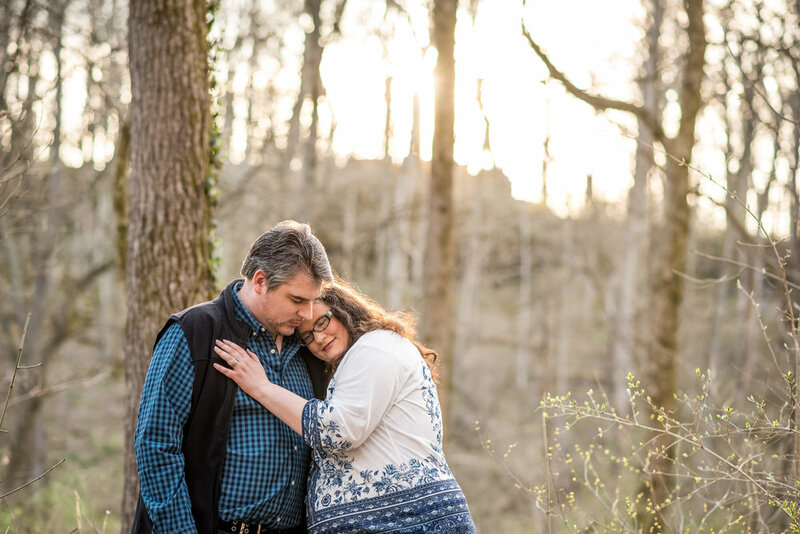 I had never even been there, let alone taken engagement photos there, but I am always up for adventure and this lovely nature reserve in Yellow Springs was sentimental to them as a photo location. Glen Helen in Yellow Springs offered such a wide variety of natural settings. From the moss covered stone stairway, to the tall trees and winding boardwalk. There were so many fun places to photograph this couple in love. Angie and Evan love to laugh and joke around, and I was more than happy to capture their sweet connection. We had so much fun exploring and shooting in the most delicious sunset light. I was worried that it would be too brown and drab, but Glen Helen was quite the photography gem. And it was made even more special that is meant something to the couple. I love capturing special details or places that have sentimental value. That's me, kind of a big sap. But that is one of the reasons I like wedding photography so much! And an engagement session is included in most of my packages so I can get to know you and so you can get to know my style and how I capture connection, emotion, light and movement. It's like a practice run for your wedding portraits and it is super fun and laid back! I love to capture natural interactions and the beautiful in between moments that make you, YOU. I am currently booking 2018 and 2019 engagements, weddings and elopements. Contact me today and let's talk about how I can capture YOUR love story!